Match ends, FC Augsburg 2, VfL Wolfsburg 3. Second Half ends, FC Augsburg 2, VfL Wolfsburg 3. Jonathan Schmid (FC Augsburg) wins a free kick in the defensive half. Renato Steffen (VfL Wolfsburg) wins a free kick in the defensive half. Foul by Jeffrey Gouweleeuw (FC Augsburg). Ja-Cheol Koo (FC Augsburg) wins a free kick in the defensive half. Substitution, VfL Wolfsburg. Felix Uduokhai replaces Daniel Ginczek. Corner, FC Augsburg. Conceded by Robin Knoche. Goal! FC Augsburg 2, VfL Wolfsburg 3. Yannick Gerhardt (VfL Wolfsburg) left footed shot from the centre of the box to the bottom left corner. Assisted by Renato Steffen with a cross. Sergio Córdova (FC Augsburg) wins a free kick on the left wing. Substitution, FC Augsburg. Raphael Framberger replaces Konstantinos Stafylidis. Attempt saved. Yannick Gerhardt (VfL Wolfsburg) left footed shot from the right side of the box is saved in the bottom right corner. Attempt blocked. Wout Weghorst (VfL Wolfsburg) right footed shot from the centre of the box is blocked. Assisted by Admir Mehmedi with a cross. Corner, VfL Wolfsburg. Conceded by Rani Khedira. Attempt missed. Admir Mehmedi (VfL Wolfsburg) right footed shot from a difficult angle on the right is too high. Assisted by William. Corner, VfL Wolfsburg. Conceded by Daniel Baier. Attempt missed. Sergio Córdova (FC Augsburg) right footed shot from outside the box is high and wide to the right. Assisted by Ja-Cheol Koo. Gian-Luca Itter (VfL Wolfsburg) wins a free kick on the left wing. Hand ball by Ja-Cheol Koo (FC Augsburg). Attempt blocked. Admir Mehmedi (VfL Wolfsburg) left footed shot from the centre of the box is blocked. Assisted by Elvis Rexhbecaj. Gian-Luca Itter (VfL Wolfsburg) wins a free kick in the defensive half. Admir Mehmedi (VfL Wolfsburg) wins a free kick on the right wing. Offside, FC Augsburg. Rani Khedira tries a through ball, but Jonathan Schmid is caught offside. Offside, FC Augsburg. Konstantinos Stafylidis tries a through ball, but André Hahn is caught offside. Offside, VfL Wolfsburg. Maximilian Arnold tries a through ball, but Admir Mehmedi is caught offside. Goal! 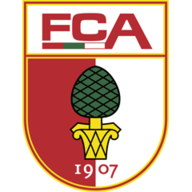 FC Augsburg 2, VfL Wolfsburg 2. Sergio Córdova (FC Augsburg) header from the centre of the box to the bottom left corner. Assisted by Jonathan Schmid with a cross. Attempt blocked. Sergio Córdova (FC Augsburg) header from the left side of the box is blocked. Assisted by Konstantinos Stafylidis with a cross. Rani Khedira (FC Augsburg) is shown the yellow card. Daniel Ginczek (VfL Wolfsburg) is shown the yellow card. Maximilian Arnold (VfL Wolfsburg) is shown the yellow card for a bad foul. Corner, FC Augsburg. Conceded by Daniel Ginczek. Goal! FC Augsburg 1, VfL Wolfsburg 2. Rani Khedira (FC Augsburg) right footed shot from the centre of the box to the bottom left corner. Sergio Córdova (FC Augsburg) wins a free kick in the defensive half. Second Half begins FC Augsburg 0, VfL Wolfsburg 2. Substitution, FC Augsburg. Sergio Córdova replaces Michael Gregoritsch. First Half ends, FC Augsburg 0, VfL Wolfsburg 2. Attempt missed. Robin Knoche (VfL Wolfsburg) header from the centre of the box is close, but misses to the left. Assisted by Wout Weghorst with a cross following a set piece situation. Hand ball by Rani Khedira (FC Augsburg). Goal! FC Augsburg 0, VfL Wolfsburg 2. William (VfL Wolfsburg) left footed shot from outside the box to the bottom right corner. Assisted by Admir Mehmedi. Attempt blocked. Maximilian Arnold (VfL Wolfsburg) left footed shot from outside the box is blocked. Assisted by William. Attempt blocked. Daniel Ginczek (VfL Wolfsburg) right footed shot from the centre of the box is blocked. Assisted by Wout Weghorst. Attempt saved. Maximilian Arnold (VfL Wolfsburg) header from the centre of the box is saved in the bottom right corner. Assisted by Admir Mehmedi with a cross. Michael Gregoritsch (FC Augsburg) is shown the yellow card for a bad foul. Offside, FC Augsburg. Konstantinos Stafylidis tries a through ball, but Michael Gregoritsch is caught offside. Goal! FC Augsburg 0, VfL Wolfsburg 1. Josuha Guilavogui (VfL Wolfsburg) right footed shot from very close range to the centre of the goal following a corner. Attempt missed. John Brooks (VfL Wolfsburg) header from the centre of the box misses to the right. Assisted by Maximilian Arnold with a cross following a corner. Corner, VfL Wolfsburg. Conceded by Jeffrey Gouweleeuw. Attempt blocked. Admir Mehmedi (VfL Wolfsburg) right footed shot from the right side of the box is blocked. Assisted by Wout Weghorst. Attempt missed. Rani Khedira (FC Augsburg) right footed shot from a difficult angle on the right is close, but misses to the right. Assisted by Alfred Finnbogason. Attempt missed. Michael Gregoritsch (FC Augsburg) left footed shot from outside the box is high and wide to the right. Assisted by Ja-Cheol Koo. Foul by Daniel Ginczek (VfL Wolfsburg). Attempt blocked. Wout Weghorst (VfL Wolfsburg) left footed shot from outside the box is blocked. Assisted by Admir Mehmedi with a headed pass. Attempt missed. Wout Weghorst (VfL Wolfsburg) header from the centre of the box is close, but misses to the right. Assisted by Yannick Gerhardt with a cross. Corner, VfL Wolfsburg. Conceded by Kevin Danso. Attempt blocked. Admir Mehmedi (VfL Wolfsburg) right footed shot from the right side of the box is blocked. Assisted by William. Offside, VfL Wolfsburg. Josuha Guilavogui tries a through ball, but Admir Mehmedi is caught offside. Attempt missed. Marco Richter (FC Augsburg) left footed shot from the left side of the box is high and wide to the left. Assisted by Rani Khedira. Attempt blocked. Ja-Cheol Koo (FC Augsburg) right footed shot from outside the box is blocked. Assisted by Konstantinos Stafylidis. Attempt saved. Alfred Finnbogason (FC Augsburg) right footed shot from the right side of the box is saved in the bottom right corner. Assisted by Daniel Baier. Corner, FC Augsburg. Conceded by Gian-Luca Itter. Jeffrey Gouweleeuw (FC Augsburg) wins a free kick in the defensive half. Attempt saved. Marco Richter (FC Augsburg) right footed shot from outside the box is saved in the centre of the goal. Assisted by Jonathan Schmid. Hand ball by Gian-Luca Itter (VfL Wolfsburg). Admir Mehmedi (VfL Wolfsburg) wins a free kick in the attacking half. Foul by Admir Mehmedi (VfL Wolfsburg).